The FAIRTRADE Mark is 20 years old in 2014; I was fortunate enough to be there to celebrate with the Fairtrade Foundation in London last night – a time to reflect upon past achievements and look forward to the future of Fairtrade. 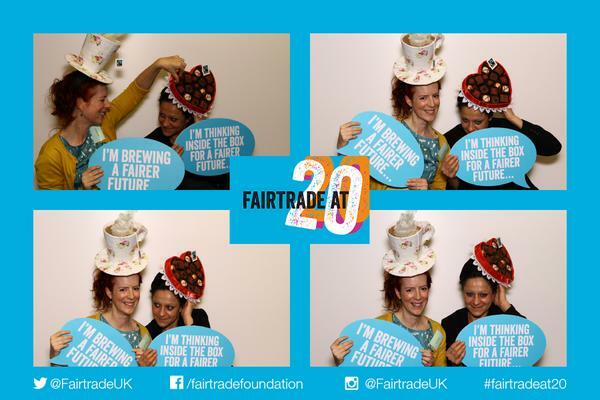 Many amazing campaigners have worked hard for over twenty years to bring Fairtrade values and products to the public, influencing business and government practice along the way. Garstang, in Lancashire, the world’s first ever #Fairtrade town, were awarded the #Fairtradeat20 special achievement award. It was quite an emotional moment to realise what they had started back in 2000 when the people of Garstang voted virtually unanimously for Garstang to become the world’s first Fairtrade Town. Well done to Palestinian #Fairtrade olive oil pioneers Zaytoun @Zaytoun_CIC – runners up in nation’s favourite #Fairtrade product awards. With huge congratulations going to the Isle of Man #Fairtrade Island campaign group for winning Outstanding Campaign awarded by the wonderfully funny and passionate egg-cracking @AllegraMcEvedy. Good to hear that one in three schools in UK now working towards #Fairtrade status. And lovely therefore to meet up with Sophie and Helen from West Yorkshire’s own – Fair and Funky who deliver interactive global themed workshops: recycling, the environment and Fairtrade; to schools and community groups.